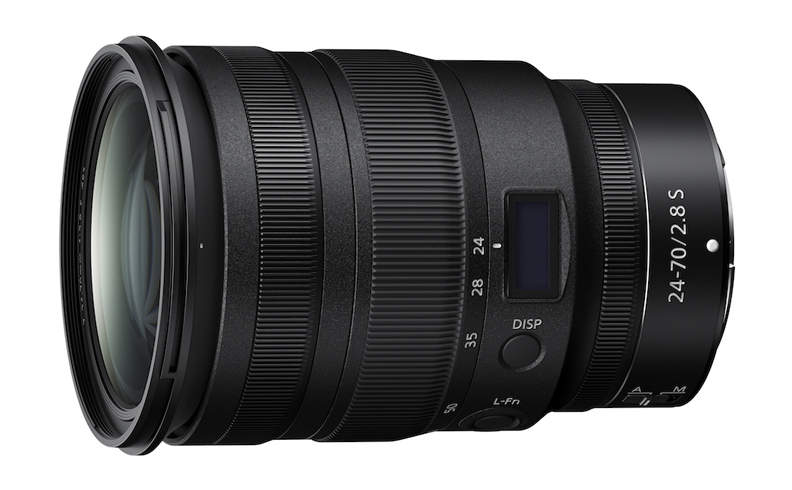 Nikon Corporation (Nikon) is pleased to announce the release of the NIKKOR Z 24-70mm f/2.8 S, a high-performance standard zoom lens compatible with full-frame (Nikon FX format) mirrorless cameras which have adopted the new larger-diameter Z mount. The NIKKOR Z 24-70mm f/2.8 S is a standard zoom lens that, when used with a full-frame (FX-format) camera, covers a convenient standard zoom range beginning at the wide-angle 24 mm and ending at the mid-telephoto 70 mm, all with a constant fast maximum aperture of f/2.8. This high-performance lens is part of the S-Line, a newly designated grade of NIKKOR Z lenses that adhere to a new benchmark in optical performance, creating new definitions of design principles and quality control. The NIKKOR Z 24-70mm f/2.8 S demonstrates excellent resolving power that maximizes the potential of high-pixel-count digital cameras like the Z 7, which has an effective pixel count of 45.7 megapixels. Color fringing is significantly minimized with the beautiful, large, natural bokeh unique to the f/2.8 aperture, which makes the lens perfect for shooting highly rendered photographs in a variety of scenes, such as portraits and landscapes, from the maximum aperture of f/2.8. Furthermore, the combination of the larger Z mount with its inner diameter of 55 mm, and a short flange focal distance of 16 mm has allowed the lens to achieve superior optical performance, as well as compactness and lightness for excellent portability. It also offers outstanding movie recording performance with focus breathing control and quiet operation. A multi-focusing system has been adopted as the AF drive system. Via the combination of multiple AF actuators, the position of the focus groups is precisely controlled. As a result, extremely accurate and high-speed AF control is realized. Also, by drastically reducing aberrations, superb imaging performance is achieved at any focus distance, including close distances. In addition, the optics that are comprised of two ED glass and four aspherical lens elements utilize not only Nikon’s conventional Nano Crystal Coat, but also a newly developed anti-reflective coating known as ARNEO Coat. ARNEO Coat is most effective at minimizing reflections of light passing perpendicularly through the lens, and its use in conjunction with Nano Crystal Coat ensures consistent and incredibly low reflection throughout the entire spectrum of visible light. Therefore, the ghost and flare caused by incidental light are effectively minimized for incredibly sharp and clear images, even when a light source is included in the frame. The lens barrel features functionality unique to higher-class models of the NIKKOR Z S-Line. In addition to a control ring, an independent focus ring has been added, enabling an ever-more comfortable operation. Also incorporated are an L-Fn (lens function) button which enhances convenience by allowing an increased number of functions that can be assigned, and a lens information panel that permits users to check a variety of functions without looking into the viewfinder. Furthermore, the adoption of a felt lining for the lens hood in addition to the lens barrel, contributes to delivering clear rendering by effectively reducing light reflection inside the hood. The NIKKOR Z 24-70mm f/2.8 S maximizes the benefits of the new system by providing outstanding optical performance, support for a broad range of focal lengths, superior operation, and advanced specifications, all within a compact and lightweight body that is extremely portable. This incredible versatility allows users to enjoy recording of high-quality stills and movies of any scene. A lens information panel that can be used to check aperture setting, focus distance, depth of field, etc.